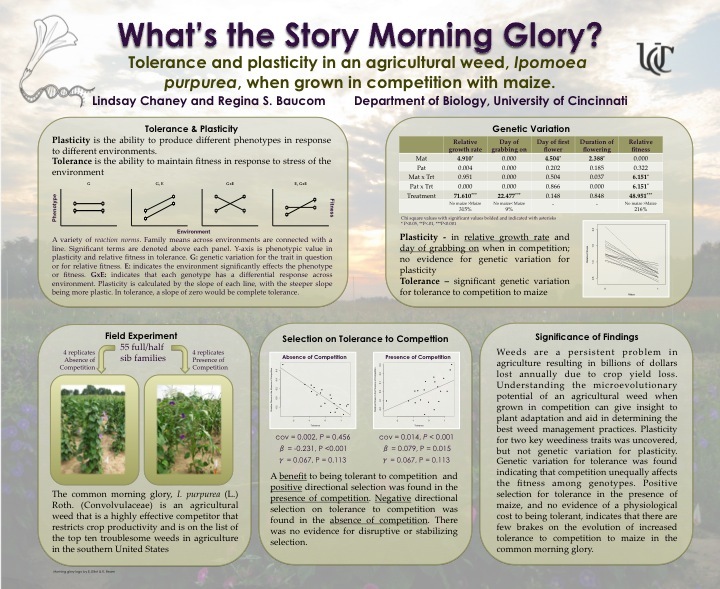 Tolerance and plasticity in an agricultural weed, Ipomoea purpurea, when grown in competition with maize. Abstract: Agricultural weeds are in constant competition for light, soil and nutrient resources with their interspecific crop competitors. Understanding the microevolutionary potential of an agricultural weed when grown in competition can aid in determining the best strategies in weed management practices to implement. Progeny from a full/half-sib breeding design was used in a field experiment to assess tolerance to interspecific competition with maize. Presence of plasticity to competition was assessed in four traits: day of grabbing on, day of first flower, length of flowering, and relative growth rate. Phenotypic plasticity is commonly considered as a trait associated with weediness and plant invasions because it may enhance the ability of plants to grow in a broader range of environments. 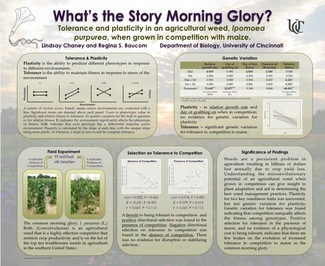 Tolerance is a plants ability to maintain high fitness levels across different environments, a trait that also contributes to the success of a weed. Assessing an agricultural weed in this way can give us further insight to its evolutionary potential and how selection may act, which may result in a more problematic weed.